By Phoenix of Elder Mountain – I have been a huge practitioner of divination for myself and for clients and apprentices, so much so, that I have them as part of my folk healing medicine bag. I continued to work with divination because my path required so much support, assistance and healing this lifetime. I have done many different kinds and now have limited them just a few main root divination. Some readings focuses on relationships, others focus on our emotional health and some through the rough patches and cycles of our life. The reason divination is so supportive is that it shines a light on where we are to focus for a solution that can be contemplated upon, rather than focusing on the whole problem. As a folk healer I focus on the whole problem, not the solution, because the healing path is not a divination path. My wisdom as a long time practitioner is… Divination does not “give” a total answer, it opens a new doorway that you haven’t thought of or seen yet, and suggests pointing your compass in a new direction for change. This is classic transformation medicine: Change or Suffer. Because this is a winter divination article, I have learned to walk with mother earth and the moon as a dreamer (shaman), and rather than break the seasonal rituals up into the four (medicine wheel) or eight (paganism) wheel. In other words, I celebrate the new year as mother earth does, on the Spring Equinox. I never try to hurry through the three moons of Winter, I welcome the night and the time of rest or going inward more completely. Pagan and religion cultures celebrate the Sun, shamanism does not because the sun is fully put to rest on the Autumn equinox and wakes up again on the Spring equinox. Living by two half year seasons (season of night, autumn and winter) and the season of fire (spring and autumn), is an older shamanic nature. It has allowed me, like the rivers that flow, the birds than sing and the animals that run, to align my emotional body and soul body to the natural rhythms of earth herself. These empower my four bodies not two (mind/body). I work with divination the same way, in cycles of the lunar moons. Divination is a good beginner point that can help us keep focused on our desires or our struggles as a beginner mirror and symbolism practice that is supportive. I hope you do enjoy your winter, new year or midwinter divination and see what it holds for you! Below are some Slavic traditions from various writers…. In Russia, the time to predict the future during the Christmas holidays from January 1 until January 19 and is considered the best time to predict the future. It’s believed that the prediction done during this time is the most accurate. Did you spend the two weeks following Russian Christmas sorting out your future? Why not? The ancient beliefs says that unearthly powers, magic and the spirit of things become available during this time. Our ancestors tried to use this opportunity to foretell their future by interpreting signs. This was carried out during the Svyatki Celebrations: the two-week period straight after the Russian Christmas until Epiphany Day. Fortune-telling traditions during these days have regained their popularity, especially in small Russian towns and villages. The most popular time for divination comes on the first Svyatki night around midnight. If a woman has a broader outlook and wants to go beyond marital questions, she can utilize some other fortune-telling techniques which require a rich imagination: predicting the future by analysing melted wax shapes (a house-like shape means that you will have your own household soon; trees with upward branches signify some joy in the future) or looking at the shadows of charred paper. Participants in this ritual take a blank piece of paper, crumple it, put it in a dish and set fire to it. When it is almost completely burned, the girls put a candle behind them and look at their shadows on the wall. Most of these methods don’t tell you your future directly, but leave you responsible for the gaps. All you have to do is to trust your own feelings and senses. Fortune-telling for younger women has been about finding love, they would usually gather at midnight, choose a dark, non-residential premises, often the bath house “banya”. There they let their hair down, take off their necklaces, rings and bracelets opening themselves up to divination. It is almost impossible to list all of the known fortune-telling methods. During Svyatki even the most ordinary things acquire a special connotation; nothing seemed accidental, any detail could become a sign, a messenger of something from the future. One was to burn equally long threads of string and the owner of the fastest burning thread is supposed to be the first one to get married or you could turn it around and say who would be the first to be divorced (in modern divination). Another traditional one is eating vareniki (stuffed dumplings). A few small meaningful objects are put into the vareniki while being cooked. A coin means money and future wealth, tomatoes foretell love, and a thread predicts future travel. Another variation is to hide copper, silver and golden rings into a pile of grain. In the older tradition, one would put a small branch of a fir tree under her pillow and repeat the following words: “I go to sleep on Monday, put a branch from a fir tree under my head, let me see what the future holds for me.” The most famous (and most scary) divination is fortune telling with a candle and mirror, which is placed on a table in a dark room a little before midnight. A person stares intently into the mirror and at the stroke of midnight she is supposed to see what she is suppose to see. To make it even scarier (but certainly more effective) you have to put two mirrors on the table facing each other and look at the gallery of reflections. This activity requires being alone or with a few close friends and total silence. Weak-nerves and the very emotional ladies are warned to avoid such fortune-telling practices. Many omens are derived from the observation of various substances dropped into a bowl of water. In Babylon oil was used. To-day in various countries melted lead, wax, or the white of an egg, is used. From the shapes which result, the trade or occupation of a future husband, the luck for the year, and so on, are deduced in the folk practices of modern Europe. Finns use stearin and melted lead, Magyars lead, Russians wax, Danes lead and egg, and the northern counties of England egg, wax and oil. Bird omens were the subject of very serious study in Greece. It has been thought that this was because in the early mythology of Greece some of their gods and goddesses were believed to have been birds. Birds, therefore, were particularly sacred, and their appearances and movements were of profound significance. The principal birds for signs were the raven, the crow, the heron, wren, dove, woodpecker, and kingfisher, and all the birds of prey, such as the hawk, eagle, or vulture, which the ancients classed together (W. R. Halliday, “Greek Divination”). Many curious instances, which were fulfilled, of bird omens are related in “The Other World,” by Rev. F. Lee. A number of families have traditions about the appearance of a white bird in particular. Favomancy is a form of divination that involves throwing beans on the ground and interpreting the patterns into which the beans fall; it is therefore a type of cleromancy. Various forms of favomancy are present across the world’s cultures. The term comes from the Vicia Faba meaning Fava bean, and by way of cult etymology, from the Latin faba for “bean” and formed by analogy with the names of similar divination methods such as alectromancy. Favomancy used to be practised by Seers in Russia, in particular, among the Ubykh. Russian methods of favomancy may still exist after the departure of the Ubykhs from the Caucasus in 1864, but the details are now lost of exactly how Ubykh soothsayers interpreted the patterns formed by the beans. The Ubykh term for a favomancer (pxażayš’) simply means “bean-thrower”, and it later became a synonym for all soothsayers and seers in general in that language. In Muslim traditions of Bosnia and Herzegovina, favomancy is called Bacanje Graha ‘bean-throwing’ and Falanje (from Persian fal ‘to bode’). The fortune-teller places 41 white beans onto a flat surface, dividing them into smaller groups using a complex set of rules. The resulting number of beans in each group is then interpreted as a favorable or unfavorable sign for the different aspects of life represented by each of the groups. oth Russian and Bosnian methods are remarkably the same, and likely share a common origin. Since the method is not present in the West, it is possible that the origin might be Persian at its roots because a similar divination method exists in Iran, involving fifty-three peas. The time is approaching when most Polish families will sit in family clusters to traditional Christmas Eve suppers. The old and the young will soon guard that the memory of all traditions that have been preserved. Many follow more strict traditional customs but many also do the important customs that are a relic of ancient pre-religious beliefs that are pagan. For over a thousand years uninterrupted, to cultivate the habits resulting from the faith of our foremothers, the winter solstice was a boisterous, two-week celebration of generous reconnection with loved ones, and symbolism of divination to see what Spring will hold in the near future. In the old ways, we had the Goddess Leshachikha, she represented mother earth, nature, harvest and protection during winter. Her symbols are the forest and all they contain such as leaves and seeds. She also appears as a Slavic Forest itself, or a wild animal (animism shamanism), Leshachikha fiercely protects Her lands and only fades away if her people no longer honor her anymore. Most male pagans only honor Leshy, the male spirit of the swamp and forest and have forgotten her old divination. But more and more women are honoring their goddesses again and bringing them back to life. She teaches us about reciprocity and about the power of nature’s fury. Leshachikha’s watchful aspect can be applied to our figurative lands as well – for example, safeguarding our homes, property and barns. Whenever you need a little extra protective energy, pick up a fallen leaf and put it in your pocket. This will keep Leshachikha’s guardian powers with you all day if you acknowledge this part of mother earth’s consciousness. To bring that protection into your home, wax the leaf to preserve it, or a winter plant, symbolically sustaining the magical energy until spring. Put the waxed leaf or herb near your entryway or in the room where you spend the most time over the winter solstice and christmas holiday through the new year until Spring. In spring you can also go to a nearby forest, field or park and scatter some seed to Leshachikha to greet Her as She awakens. A Slavonic forest Goddess (les = forest), Leshachikha is a rather temperamental energy of the spirit of mother earth who fiercely guards her lands and animals of the woods, and will eventually someday punishing those who abuse them.Leshy is her constor and she is mother of the Leshonki. Fortune telling and predicting the future around Christmas time are still practiced today. Walnut shells are cut in half and a candle is placed in it. The shell is then floated on a bowl of water, if it makes it across the entire bowl, the person will live a healthy year, but if it sinks there will be struggles in the new year. Maidens always want to know if they are getting married in the year to come and the Czech were no different than other slavic people. On their divination, they did it on Barbara’s Day, which is December 4th. A maiden would go outside and cut a branch of a cherry tree and place it in water. If the branch blooms by Christmas Eve, she will get married that year. If she is not interested in marriage at that time, then it will be a favorable year regardless. If a goat is given apples to eat on Christmas eve, the milk will be sweet. Also if your hens are fed poppy seeds, peas, wheat and barley, they will lay lots of eggs the following year. Like other Slavic countries, shoes are somehow always involved. She can throw a shoe over her shoulder aiming at the door. If the toe of the shoe points toward the door, she will be a bride within a year. Basically all tea readings are done the same way, after a cup of tea has been poured, without using a tea strainer, the tea is drunk or poured away. The cup should then be shaken well and any remaining liquid drained off in the saucer. The diviner now looks at the pattern of tea leaves in the cup and allows the imagination to play around [with] the shapes suggested by them. They might look like a letter, a heart shape, or a ring. These shapes are then interpreted intuitively or by means of a fairly standard system of symbolism, such as: snake (enmity or falsehood), spade (good fortune through industry), mountain (journey of hindrance), or house (change, success). Most readers ask the querent to drink the tea off, then swirl the cup. Its ill-advised for one to attempt tasseography using tea from a cut-open tea bag or to use a symbol dictionary. The reasons for these prohibitions are practical: tea-bag tea is cut too finely to form recognizable figures in the cup and tea-leaf reading has its own historic system of symbolism that does not correspond exactly with other systems, such as symbolic dream divination. As a pagan nation, ancient Latvians dedicated lots of time to fortune telling. Christmas eve was not an exception. If someone wanted to know what the next year’s harvest will be like, or health and a good year, the wanted to know the time of possible marriage, Latvians also liked to bewitch luck! Very similar activities are done in waiting for the New Year and apart from the modern countdown of 5, 4, 3, 2, 1 and fireworks, the Latvian ancestry were keen on fortune-telling and mummery. For New Years Latvians would prepared fish as one of the dishes – the scales afterwards – were put into a wallet to prevent the lack of money. Fortunately, the traditions which come through the generations give so much happiness and wisdom, so we can use them to make ourselves better. And if the fact that Christmas and New Years are annual events makes these festivals less attractive, think twice! People are heading back to their roots to comprehend the history and to value the knowledge and wisdom that it holds. Believe that every tradition really works! Want to know who you will marry? Stand with your back to a fireplace and bend forward to look into the fire through your legs and you might see her or him! Want to have a lot of money? A proverb says that a lot of money will come to you if a black cat is carried around the church on Christmas Eve. Wax divinations prepared by Urzecze Ensemble. This is a feast celebrated on the night of 29th and 30th of November. It’s believed to be a magical night suitable for the love spells, and was celebrated throughout the centuries mostly by the unmarried people who wanted to reveal their future husband or wife. Similar feasts are also observed for example in some parts of Ukraine, Slovakia, Russia, Germany, Austria and Romania. A BIT OF HISTORY – The original name of these celebrations was lost in history. The oldest historical sources confirm that this kind of custom was an old tradition in Poland already around 14th-15th centuries. Informations about Polish women who were sentenced to death for conducting wax divinations (described below) can be found in 16th-century documents. Nowadays the Poles celebrate primarily the Andrzejki (St.Andrew’s Eve), but some remnants of a similar feast of Katarzynki also survived – it was celebrated on the Eve of St. Catherine / Katarzyna (24th 25th Nov), and survived the longest in the region of Biskupin. It is said that Andrzejki was dedicated primarily to the girls who wanted to know more about their future partner, and Katarzynki was the best for the boys to make divinations. 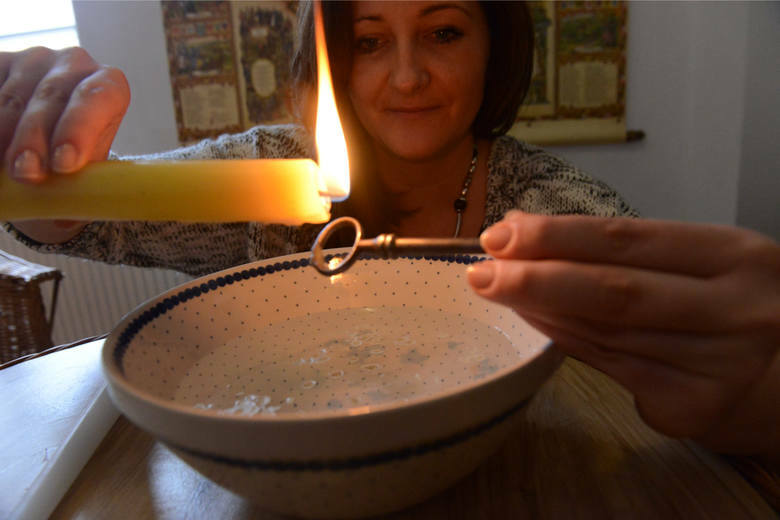 The most popular form of divinations in Poland is pouring hot wax onto cold water. The wax is first melted over fire in a small mug, and then poured through a keyhole. People wait until it hardens properly in the cold water, then the pieces of wax are held against a candle to produce shadow on a wall. Its shapes symbolize things that will happen in the upcoming year. Instead of a key, in the old days people were using for example woven straw or a horseshoe. People who find it impossible to get a proper key sometimes cut a shape of a key out of hard cardboard. In the past many people were using melted lead instead of the wax for the divination. Other popular divinations include a race of shoes. People gathered in the room take off one of their shoes and everyone places them in one line on the floor. The last shoe in the line is carried to the front – the process is repeated until one of the shoes reaches the front door and crosses the threshold. Originally it symbolized a girl leaving her home, and owner of the lucky shoe who ‘went out’ (crossed the threshold) first was believed to become the first from the group to get married in the future. Preparing the shoes for divinations (Urzecze Ensemble). Some old divinations involve also the house pets – cats or dogs. Each person prepares a small bowl with treats – for example milk for a cat or pieces of meat for a dog – and then places it on the floor. Owner of the bowl from which the pet eats first was believed to become the first to get married or find their true love (it depended on the intentions of the divination). In the old days the treats were prepared very carefully – they were for example small cakes made of certain ingredients, mixed with water that was gathered in a certain way from a well or a brook (brough home for example only in a red mug or only in your own mouth), and baked over fire that was ignited with a wood plank borrowed (or stolen) from a neighbour. If the pet runs away out of the room with the treat, it was also a good sign meaning a marriage (symbolic crossing of the treshold). However, if the animal hides under a bed with the treat, it meant death of the food’s owner. If the food is only bitten and left in the bowl or close to it, it meant that the partner would break up. Treats prepared for a dog. Drawing by Robert Sawa. Other popular divination require preparing of pieces of paper with names of the crushes written on it. In one of the versions the paper (preferably in a shape of a heart) is then turned around and pierced with a pin to reveal which of the names is the future spouse. The paper can be also pinned to a wall and serve as a dartboard. In another version, much older, the people prepare small strips of paper, in a form of lots, and put them under the pillow – they draw one in the morning right after waking up. Regardless of the version, the papers should always have at least one empty spot / one empty lot in case neither of the chosen names is the destined one. Before another popular game of divinations the people prepare mugs, flipped upside-down, and hide a symbolic accessory under each of them. The mugs are shifted around, and a person (with their eyes covered) chooses one. The hidden accessory indicates the future. It could be for example a ring or a female cap meaning marriage; a twig of rue or a dry leaf meaning spinsterhood / bachelorhood; a rosary, its beads, or a cross meaning a religious life or even life in a monastery; a coin meaning a wealthy life (but not necessarily full of love); a doll meaning an illegitimate child. One mug should be always empty – it means that nothing will change in the nearest future. The divinations have dozens of regional types in Poland, and often take forms of various games or competitions. Many customs are sadly forgotten or not practiced anymore, only being told in stories by the oldest generations. In the modern days the people treat Andrzejki as a special night that strengthens and ensures effectiveness of various divinations – many of modern activities come also in forms that are known worldwide, for example reading cards or tea leaves. Alphonse Maria Mucha woman with a burning candle.